This Sunday I’d like to share a piece of artwork drawn by Adam Hughes. It’s more of a sketch and that’s what I love about it. It’s almost a gesture drawing with some sharply defined angles. Ororo really looks likes she’s flying. So many artists aren’t able to really capture that flight of fantasy, but Hughes nails it. I think it’s partly due to how he’s positioned her arms (especially the wrists) and how Storm’s cape gives her ballast. Hughes also gets extra kudos from me for having Storm’s tiara frame her face in such a bold fashion. The design is reminiscent of how Dave Cockrum and John Byrne made it famous. I’m sure Adam Hughes has drawn Storm much more than this, but I don’t have any other pics of his work of Ororo in my favorites. 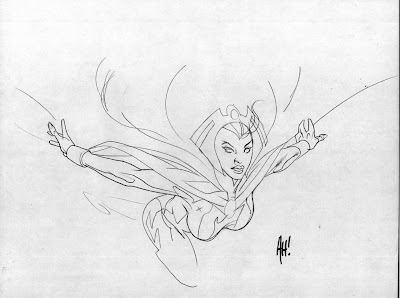 However, this rendering is one of my favorite depictions of Storm in general, not just of this artist. And although I’m curious to see how it would look fully inked and colored, part of its appeal lies in its unfinished state.